Domaine de l’Île au Canot – Packages for every taste! Upon your arrival on Île au Canot, once you’ve gotten comfortably installed with your family or friends, you’ll have the enjoyable sensation of finding yourself in a very special place. This island inspires relaxation, comfort and fulfilment. Whether you’re looking to hit the island’s trails at daybreak, or to hear the calls of rare birds or enjoy the magnificent sunsets, you’ll leave with a feeling of well being like you’ve never felt before. Offer yourself a special occasion with our Lodging Package, that includes accommodations in the main residence that can accommodate up to 10 persons. Take the time to breathe, to discuss, to listen and to share some unforgettable moments with your loved ones with this package at Île au Canot! Offer yourself a wide range of services during your stay! On your trip to the resort, take advantage to explore all its wonders! With the Sand Banks activity, take a cruise and picnic on some magnificent sand beaches that appear at low tide in the centre of the Saint Lawrence. A unique experience that’s exclusive to the island! From May until mid-June, take off on an adventure to enjoy nature at its purest! Observe the colony of small penguins found at the heart of the Saint Lawrence – or take a birdwatching excursion right on Île au Canot! Head off on a discovery of Île au Canot guided by an experienced ornithologist and discover all kinds of birds. A one-of-a-kind show and an unequalled natural experience! 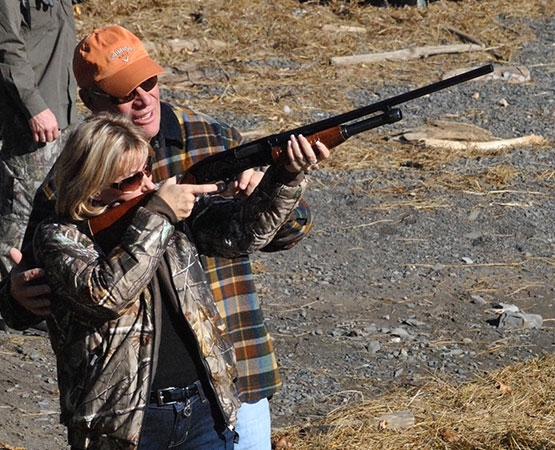 Offer yourself a clay pigeon shooting session with a guide. This activity includes: firearm, clay pigeons (2 cases) and cartridges (1 case). A fun activity to do with friends where you’re sure to enjoy yourself, whether you’re a beginner or an experienced shooter. Make the most of your stay with a half-day fishing trip in the islands. Fishing rod for those that need one (accessories sold on site). Enjoy a unique hunting experience on Île au Canot. The Hunting Package includes accommodations with a magnificent view of Isle-aux-Grues in an inviting and comfortable residence, where you can taste gourmet meals prepared by our head chef. This residence can accommodate up to 10 persons. Pheasants killed or wounded are invoiced at the end of the stay at $20/unit. *Maximum of 6 hunters and 4 non hunters (possibility of matching one or more groups of people). Whether you’re a beginner or experienced hunter, the Pheasant Hunting Package offer yourself the excitement of a thrilling hunting experience! 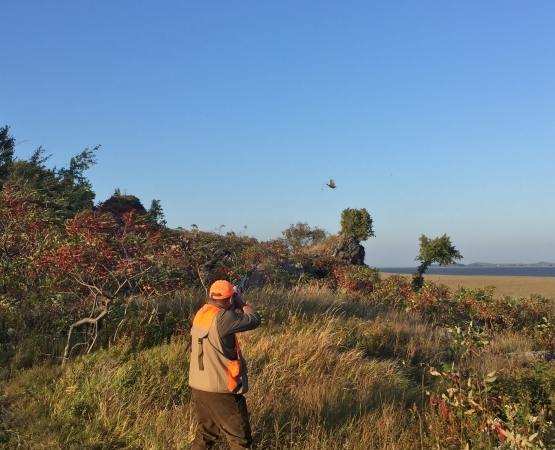 Île au Canot offers a unique hunting experience, combining challenge, ability and fun, all in an enchanting natural surrounding in the middle of the Saint Lawrence River! You’ll also get a chance to meet Sam, our adorable working hunting dog. If you wish, you’re welcome to bring your own dog. Relaxation and a picnic in the afternoon. * $24 per pheasant killed, ready to carry, will be added to the base rate.